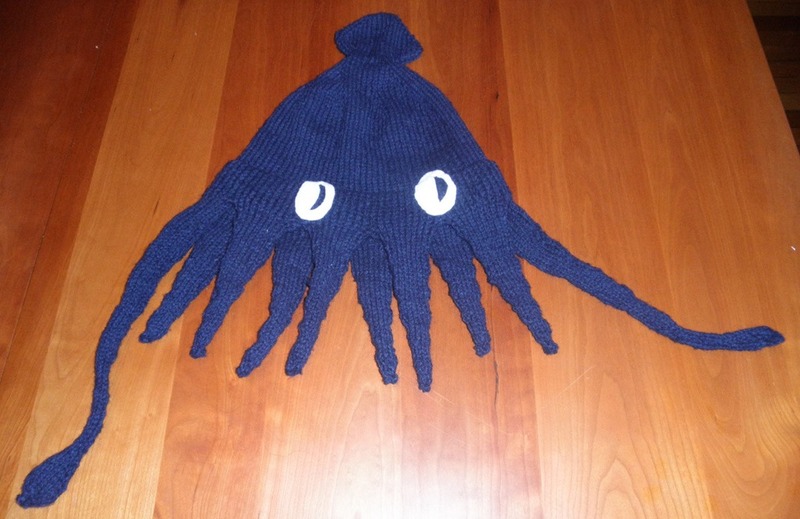 It’s been brought to my attention that the Squidley squid hat pattern I posted in December, 2011 has disappeared from this blog site. Although lots of links broke – understandably – when we ported the site from the old hosting service to WordPress, I have noticed that things go AWOL. Especially older blog pages, for no apparent reason. So I repeat myself. Eventually I’ll redraft this and add it to my pattern archive, reachable at the links above. But for the time being, here’s a blast from the past. A brief foray back into knitting. A long-deserving, cephalopod-loving pal of mine bespoke a hat. Not just any hat, a hat in the shape of a squid. How could I turn down a challenge like that? So this weekend past, finishing up last night I made one. There are several squid hat patterns on the Web, but I didn’t want to make any of them. I wanted to make a more hat-shaped hat, but with fully-rounded tentacles. I thought about knitting the tentacles first, then working up from there. While there are glove patens that start fingertip and work down, I dismissed the idea as being too fiddly. And seaming the tentacles onto a brim-up cap – even with mattress stitch onto a provisional cast-on row wouldn’t give the “bodily integrity” I wanted. So I decided to work top down with a double-knit ear band, with tentacles worked in the round. The following post-mortem can’t properly be called a pattern, but the adventurous might be able to work up their own hat from it. I used approximately 150g of a DK-weight rustic wool, and US #6 (4.0mm) 10-inch long double pointed needles. I also used 12 stitch markers (four of one color, eight of another), plus a double pointed needle of indeterminate size as a large stitch holder later on. I used small scraps of white felt to make the eyes, and sewed them on. Large sparkly buttons or commercial googly-eyes could also be used. Duplicate stitch in a day-glow yarn would be suitably squid-like. My gauge ended up being a very stretchy 5.25 stitches per inch, with the double knit section being looser. I violated every rule of knitting, making no gauge swatch, and planning nothing out before hand. I can’t speak to quantity or yarn name – this being a coned Classic Elite remnant from their old back room, well aged in my stash. I started at the top, with a standard figure-8 cast on, the same one I use on all my socks, putting six stitches each onto two needles (12 total). From there I increased standard-sock toe style (at both sides of the toe, every other row) until I had 40 stitches total. Then I decreased at the same points I increased, but upped the rate to every row, until I had 20 stitches total. I worked a couple more rows plain to finish off the little squid-wing nerdle at the top. After that I designated five evenly spaced increase points and began shaping the top of my hat, working make-one invisible increases at each marker, working them every other round. About 2 inches down from where I began the hat body increases, I added an additional five increase points to broaden out the shape a bit and make it more full. I worked those in the same every other row progression as the other five until I had 88 stitches, and the hat body was wide enough to sit comfortably on my head. From there I continued in stockinette for about 4 inches, until I had reached the top of my ear (more or less). At this point things become interesting. On the next round, I took a second strand of yarn and holding it with my main strand, knit all the way around with both strands. This was the set-up row for the double knitting section and doubled the number of loops on my needles. 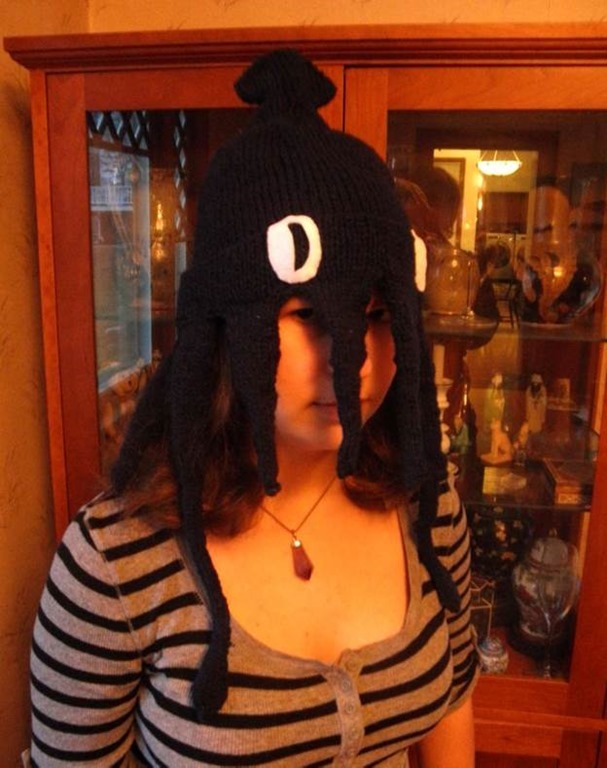 From here to the point where the tentacles start, the hat was worked double-knit style. I do this using a strickfingerhut (knitting strand manager thingy), to hold my strands side by side, but some people prefer to work double knitting in two passes. In either case, what you end up with is two layers of knitting, “back to back.” Remember – I worked the set-up row using two strands of yarn. As I work the next row I will tease the double loops I just made apart, and treat each one as a stitch. I will also use the two strands of yarn separately (this is where the strickfingerhut comes in handy to manage them). Using Strand A, I knit one of the two loops that make up the first of my set-up row stitches. Using Strand B I purled the other loop of that first set-up row stitch. Taking care not to cross the strands, I continued this way all the way around, alternating knit-with-A stitches and purled-with-B stitches. I ended up with 88 knits interleaved with 88 purls, for a total of 176 stitches. NOT TO WORRY – the hat will NOT grow twice as wide. My own gauge for double knitting is slightly looser than plain one-strand stockinette I worked this way for about two inches to make a nice, cushy, warm earband (which is not a bad idea on any top down knit hat). At this point the hat-part of Squidley was done and it was time to make tentacles! Squids are decapods. They have eight shorter tentacles plus two longer ones with little pad-like sucker-bearing ends. The two longer ones are often skinnier than the other eight. This worked out well for me as you will see. Taking care to begin on the stitch column that aligned with the center of the squid-nerdle at the top of the hat, so that the two long tentacles would be properly lined up with the sides of the hat, I began moving my stitches to my spare circ. As I moved them I placed tentacle defining stitch markers, like this. I used two colors of marker (marker and Xmarker) to make life easier. Then I shuffled the stitches around the circ so that I was at one of the Xmarkers that designate the smaller tentacle. I took two of my DPNs and moved the stitches onto them BUT I held my two receiving needles in one hand and put knit stitches onto one and purls onto the other. I ended up with two needles held parallel, with the stitches assorted around them, ready to knit in the round in stockinette like the finger of a glove. You might like to use more and shorter DPNs, but all I had in this size was a set of 3, so I was stuck.. All of the tentacles begin this way, shuffling stitches from the long circ onto DPNs for working in the round. I worked the two long tentacles first, shuffling stitches around the DPN to get to the second one, so that the memory of working the first one would be fresh (remember, I was working on the fly with no written directions). To make a long tentacle – Starting with 16 stitches, Work in stockinette for 10 rounds. K2 tog, k6, k2tog, k6. Work in stockinette for 10 rounds. K2 tog, k5, k2tog, k5. Work in stockinette for 10 rounds. K2tog, k4, k2tog, k4. Continue this way until only 6 stitches remain. At this point I moved the stitches to one needle and worked another 2 inches I-cord style, then I divided my stitches back onto two DPNs to make the sucker pad. Make 1 (invisible increase), K3, M1, K3, knit one round. M1, K4, M1, K4. Knit one round. Continue working this way until you have 16 stitches total. On next round K2tog, k4, SSK, K2tog, K4, SSK. Then K2tog, k2, SSK, K2 tog, K2, SSK. Then K1, K2 tog, K2, K2 tog, K1. The final row is S1-k2tog-PSSO, S1-k2tog-PSSO. Break the yarn leaving an ending tail, and thread the tail through the final two stitches to end off. To make a short tentacle – Starting with 18 stitches. Work in stockinette for 5 rounds. K2tog, k7, k2tog, k7, work in stockinette for 5 rounds. K2tog, k6, k2tog, k6. Work in stockinette for 5 rounds. Continue this way until you reach the row that leaves you a total of six stitches. Knit only one row of stockinette instead of five at this point. Then S1-k2tog-PSSO twice, break the yarn leaving an ending tail and thread the tail through the final two stitches to end off. Finish off all ends, and sew on eyes of your choosing!